20 years ago the first book in the A Song of Ice and Fire series was published, so to celebrate, Random House in partnership with George R. R. Martin and HBO Global licensing created two unique collectors boxes. Take $20 off the Special Edition ($75) or Limited Edition ($200) box with promo code GIZ20. 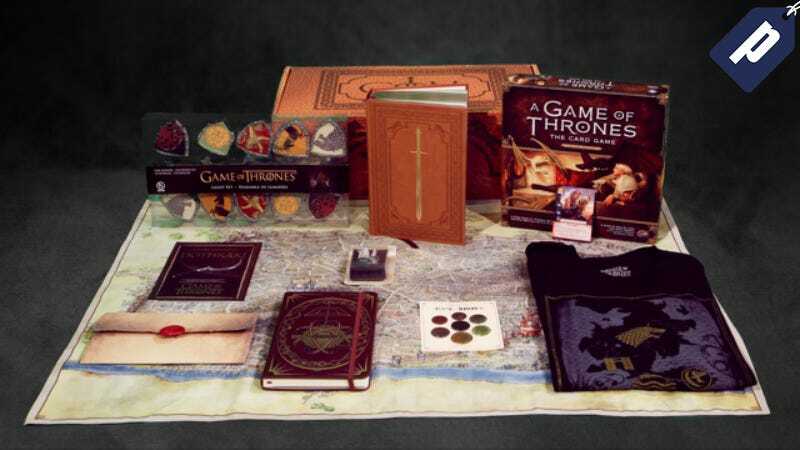 With each box you’ll receive a collectible anniversary edition of A Game of Thrones featuring gilded edged paper color illustrations, color endpaper maps, and a ribbon marker. You’ll also get an exclusive HBO Game of Thrones t-shirt, a Reproduction of Robert Baratheon’s Will, a Living Language Dothraki online course, and an Iron Coin of the Faceless Man. Lord Commander Jon Snow and Queen Daenerys miniatures (more here). These collectable boxes are available for a limited time, so grab yours today and save $20 with promo code GIZ20 on the Special Edition or Limited Edition Sets. Not valid on previous purchases.